One of my favourite things about being a Stampin' Up! Demonstrator is that I don't have to be creative. Yes, I do come up with some beautiful projects on my own; but many times I CASE (copy and share everything) my ideas. This past weekend I attended a demonstrator meeting where I got to chat with other demos about the business side of our Stampin' Up! hobby. During the meeting we had a swap and I brought home 44 beautiful card designs to share. 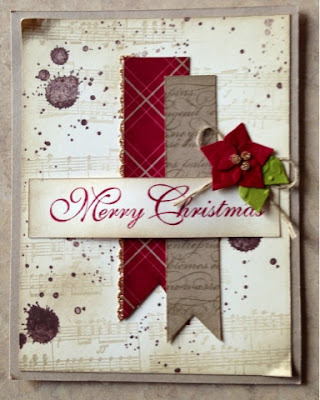 One if my favourites features the new stamp set Gorgeous Grunge. Unfortunately, the talented demonstrator who made this card forgot to put her information on it, so I can't give her credit where credit is due. To order Gorgeous Grunge or any of the other products seen here, email me or order 24/7 from my online store.